Namaste England trailer LIVE updates: The much-awaited trailer of Namaste England starring Arjun Kapoor and Parineeti Chopra is scheduled to release today, i.e September 6, 2018. Helmed by Vipul Amrutlal Shah, Namaste England marks the sequel of 2007 film Namaste London starring Akshay Kumar and Katrina Kaif. 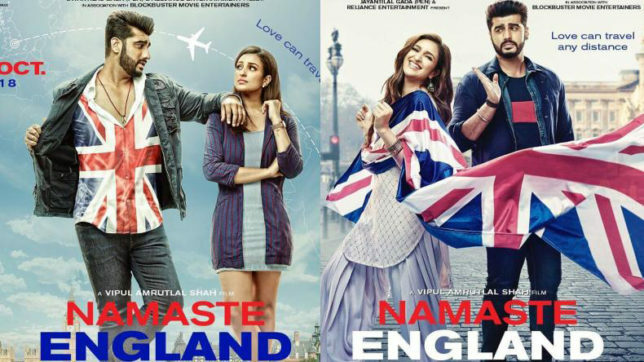 Namaste England trailer LIVE updates: Get excited as the much-awaited trailer of Arjun Kapoor and Parineeti Chopra-starrer Namaste England is all set to release today. With intriguing posters and the sparkling chemistry between the lead stars, the film has raised excitement among the fans and has emerged as one of the most anticipated films of the year. Marked as the sequel of Akshay Kumar and Katrina Kaif-starrer Namaste London that released in 2007, Namaste England is once again directed by Vipul Amrutlal Shah while it is bankrolled by under the banners of Pen India, Namaste Production Ltd, Reliance Entertainment and Blockbuster Movie Entertainers. Before the release of the trailer, Parineeti Chopra took to her official Instagram handle to share her feelings for her co-star and close friend Arjun Kapoor. In the post, she stated that Namaste England is arguably her biggest film till date. She added that this is one film that she dreamt of doing since a long time and when she stood on the film set in a traditional Indian outfit for the first time, she felt she was home. Anil Kapoor says Namaste England trailer starring Arjun and Parineeti will make you fall in love again. Namaste England trailer receives mixed reviews from film critics and audience. Parineeti Chopra shares Namaste England trailer on her Twitter profile. Arjun Kapoor shares the trailer of Namaste England on his Twitter profile. Fans and celebrities cannot wait for Namaste England trailer. Parineeti Chopra piques interest among the audience before Namaste Engand trailer launch.